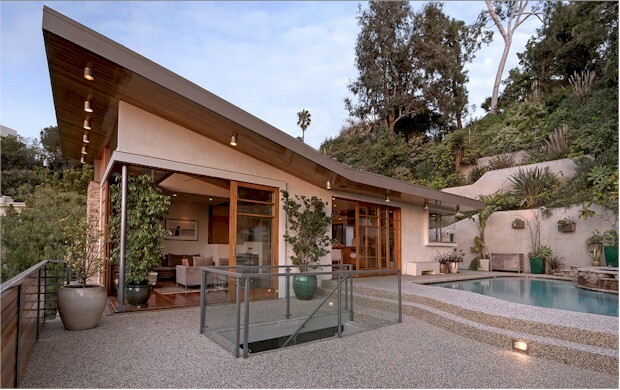 Take a look at this1957 Los Feliz architectural masterpiece inspired by Schindler and Neutra modernism. High in the hills of Los Feliz, the house is warm blend of wool, steel and glass boasting views of the Griffith Observatory and Hollywood Hills is truly unique. Inside you’ll find 2700+ sf of living space which includes 4 bedrooms and 3.5 baths. The master suit has two closets and two baths. 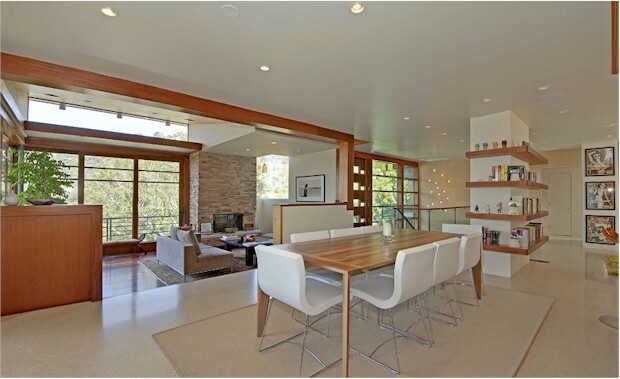 I love the clean lines and open feeling as the rooms blend into each other and to the outdoors. Sliding doors from the dining room to the back yard pool and space make for easy indoor-outdoor entertaining. The home’s lower level features a guest suite and separate office or gym offering a nice separation from the other bedrooms on the floor above. Natural light flows through the windows, making it feel even larger than it is. This unique Los Feliz architectural home is something to see. Currently listed with Hilton & Hyland for $2,6999,000 This beautiful piece of architecture is definitely worth checking out.